How have the RADAR's makers iZ kept their flagship multitrack digital system relevant in today's world of software recording? Back in 1994, Canada's Creation Technologies released the world's first 24-track hard-disk random-access digital audio recorder, the RADAR I. This and its successor, the RADAR II, were distributed by Otari under an exclusive licence. When that partnership ended in 2000, Creation spun off the RADAR into a separate company, the iZ Technology Corporation — which almost immediately launched the RADAR 24 under its own brand, before updating this to the RADAR V in 2005. 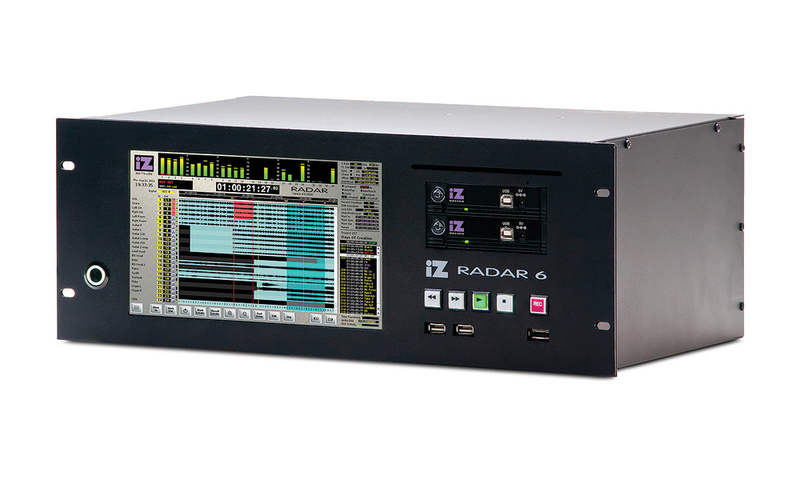 In 2012, iZ unveiled the latest RADAR 6 iteration along with the ADA II, an update on their ADA stand-alone A-D/D-A converter, which is designed to allow DAW users to get the 'RADAR sound' in non-RADAR recording setups. The ADA II features Pro Tools HD and HDX connectivity that enables Pro Tools users to use one or two ADA IIs in place of a Digidesign 192 I/O interface. The very fact that the RADAR is still in production today, in close to its original form, bears testament to both an impressive clarity of vision and a deep understanding of the needs of audio professionals, not to mention an almost obsessive focus on user and product support. Let's start with the flagship hard-disk recording system. Like its predecessors, the RADAR 6 is a modular 24-track record/playback system. The feature set is chosen from an option list to fit the needs and budget of each purchaser, and the starting point is the RADAR 6 Frame. This houses a motherboard carrying the unit's 3GHz dual-core Pentium CPU, video card and iZ's proprietary Adrenaline DR and System Interface Cards. Two separate switched-mode power supplies provide the necessary voltages to the analogue and digital circuitry. The recent release of a new, high-efficiency analogue power supply for the RADAR 6 and the ADA II eliminates the need for a cooling fan, thus removing the fan noise that has been an issue for RADAR units in the past. Externally, the RADAR 6 follows the rackmount black metal paradigm of its predecessors. However, this time round, the front panel is dominated by an optional 10.1-inch widescreen, high-resolution, multi-page touchscreen that displays RADARView, iZ's proprietary RADAR GUI. Nestling next to this are twin drive bays that contain one or two SATA drive receivers accepting 120GB solid-state SATA drives in removable SATA/USB 3 carriers. An Ultra High Speed SDXC card slot can be fitted in place of the SATA drives and a Blu-ray/DVD-R/CD-R combo drive can also be specified. Sitting under the front-panel transport controls are a single e-SATA port and twin USB 3 slots — used for file transfer or recording purposes — which complete the front-panel connectivity. The rear panel is a much busier affair. Alongside the standard word clock, AES3 and S/PDIF I/O connectors, there are spaces for optional cards for Sync II (Timecode, MIDI, RADARLink and Sony 9-pin), for the various multi-channel analogue and digital audio I/O and for three assignable footswitches. Also present are connectors for remote controls, monitor, gigabit Ethernet and the unit's four USB 2 slots. The 24-channel analogue I/O option can be partially or fully fitted with any combination of the eight-channel Classic 96 and/or 192kHz-capable Ultra Nyquist I/O cards. 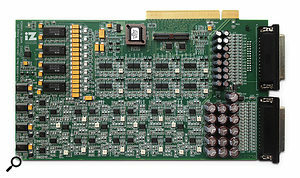 The multi-channel digital I/O can be chosen from any or all of the available 24-channel option cards: MADI, AES Multichannel and either ADAT or TDIF. The available remote controls are the KC24 Compact Remote and the full-function Session Controller Pro, with or without the optional meterbridge. Although you can operate a touchscreen-fitted RADAR 6 efficiently without either an external monitor or a remote, the combination that unlocks the functionality of the RADAR 6 for me is a widescreen DVI monitor paralleling the touchscreen display (which is the reason that the RADAR 6 touchscreen is optional) plus a Session Controller Pro and a mouse. In essence a RADAR 6 minus its recording ability, the ADA II is a stand-alone 24-channel A-D and D-A converter that is fitted as standard with the same MADI-format digital multi-channel I/O card as the RADAR 6. Analogue I/O options are similar to those of the RADAR 6, except that instead of their being sold in eight-channel I/O blocks, a licence-based system allows the user to specify an upgradeable combination of separate eight-channel input and output blocks. 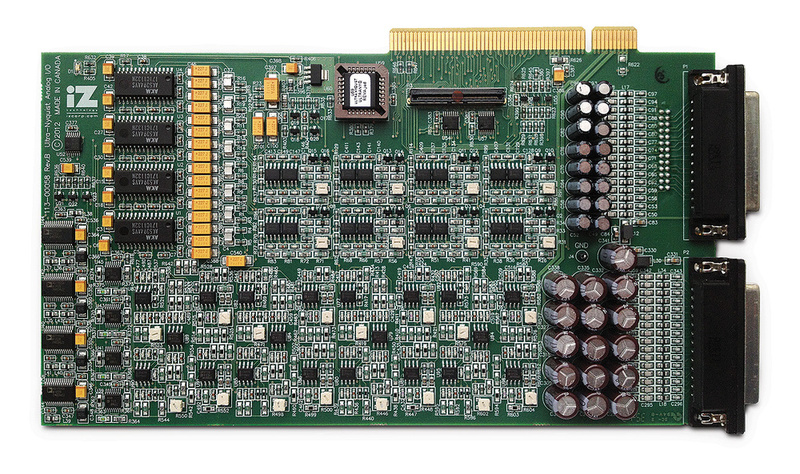 On the digital side, the RADAR 6's ADAT and AES Multi-channel option cards are offered. Stereo AES3 and S/PDIF I/O and word clock are standard, as on the RADAR 6. The ADA II allows DAW users who like the sound of the RADAR converters to integrate said converters into their systems. For use in Pro Tools setups, the ADA II can be fitted with iZ's own dual Pro Tools HD interface. The iZ interface carries two (A and B) HD I/O ports that plug directly into the Pro Tools Core card, two HD MADI optical ins and outs, and a USB port for future functionality upgrades. The A I/O is connected to the ADA II's on-board MADI card and the B I/O can be driven by a second ADA II, giving up to 48 channels of Pro Tools HD I/O without the expense of buying another HD interface. The rear-panel connector layout is identical to that of the RADAR 6, apart from the addition of the Pro Tools HD interface and the deletion of the RADAR 6's footswitch option and RADARLink card. The touchscreen in the ADA II is standard, not optional as on the RADAR 6, and provides single-touch access to separate screens showing meter levels, system configuration, I/O routing and, on the meters screen, single-touch selection of sync source and sample rate.As on the RADAR 6, an external monitor and mouse can also be used alongside the touchscreen. Operationally, the new RADAR 6 will be instantly familiar to existing RADAR users, even to the extent that certain cards from older units (RADAR II onwards) and existing Session Controller remotes can be used with the new version, thereby lowering the cost of upgrading to the latest specification. RADAR users naturally become extremely adept at navigating their way around their remotes and, once I started working with those, it was easy to see why. RADAR was originally designed as a direct replacement for a tape-based multitrack, and the Session Controller Pro — especially when fitted with the optional 24- or 48-track meterbridge and roll-round stand — retains much of the vibe of an old auto-locator, even down to the way that the transport controls allow for tape-like forward and reverse wind times, although, unlike old tape machines, locates are instantaneous. The Session Controller Pro has track-arm switching for two RADAR units (48 tracks), but can also be switched to address two further units as tracks 49 to 96. The RADARLink protocol keeps all those units in sync and allows the remote to talk to the units collectively or individually, providing that all have the same versions of the Adrenaline recording engine and RADAR software installed. Just in case that isn't enough for you, RADAR Network Control (RNC) software can send most of the RADAR command set via Ethernet to multiple machines around a network. The layout of the Session Controller is almost exactly duplicated on the touchscreen and is, at first sight, slightly quirky. However, the more you use it, the more logical it becomes. Other than the transport controls, the keys that control the zoom levels and scrolling in RADARView and those that mark In, Out and Sync points, the RADAR 6 is driven via a series of hierarchical menus. The most commonly used menus can be accessed directly via dedicated keys on the keyboard or touchscreen, and any menu can also be called up by the remote's Menu/Prev key. A neat touch is that menus can be navigated by using the QWERTY keys. For example, pressing the Menu/Prev key followed by 'E' will bring up the Edit menu, and repeated presses of the 'S' key will cycle past the System, Sync and Shutdown menus and so on. Pressing Enter then takes you one level down into the selected menu, where the same rules apply. You can also use the arrow keys for navigation, but I personally found the QWERTY keys to be much more convenient once I knew my way around the menus. There is also the facility to record up to eight macros of repetitive key combinations in order to make life easier. All the main recording functions and menu keys lie conveniently under your right hand and their operation quickly becomes familiar. What surprised me somewhat at first was just how important the Mark In and Mark Out keys are to the RADAR 6's operation. Not only are these keys used to define auto-punch in/out points and the like, but they also become central to defining clip boundaries for export, import, cut, copy and paste operations. I'd expect to be spending Far more than a simple hard-disk recorder, the RADAR 6 allows quite sophisticated editing of multitrack recordings. a lot of time on these two keys when overdubbing or comping tracks. One nice overdubbing touch (which harks back to RADAR's tape origins) is the facility to go into record from play on the fly just by hitting the Rec key. There isn't the space here to run through every function on the remote — the 234-page manual does an fine job of that already — but certain elements did catch my eye. One such is the use of the track arming buttons not only for their usual function, but also to solo tracks or to select them during various track-level editing functions. Another function that I would have killed for in the old days is Modify Edit. This allows the editing of the timing of the record in and out points after recording has taken place, and thereby eliminates, for example, the need to undo and re-record a perfectly good drop-in due to you being early on a punch-in and/or late on a punch-out. Although its editing facilities are not as comprehensive as those of a fully fledged DAW, you can carry out highly accurate cut, copy and paste (insert or overwrite) edits on the RADAR 6. You can even do this from the touchscreen, though I personally much prefer a nice big monitor and mouse for the task. A Move function not only allows you to move single or multiple track clips from track to track, but also lets you reposition clips on the timeline, either overwriting or shifting the following audio. The Slide function allows clips to be moved to millisecond precision but, this time, preceding or following audio is always overwritten. The Loop function is yet another useful tool that would have saved me a lot of time in the past, with its facility to loop and record clips of single or multiple tracks multiple times. Those duplicate loops can either be used as is, or different duplicates can be edited together and the whole lot re-looped again if required. 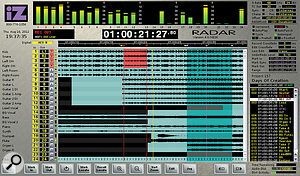 Alternatively, the original tracks can be exported into a DAW and the looping carried out there, since RADAR's use of the Broadcast WAV file format makes the export and import of time-stamped files and clips extremely easy to accomplish, irrespective of whether the destination drive is network-connected or an onboard 64/128GB SD card, external USB (or eSATA) drive or a USB stick — all are compatible as long as they are FAT32-formatted. RADAR 6 can import and export WAV, BWAV and Red Book (CD-DA) files for editing and file back-up purposes. When these files are imported, sample rates and bit depths can be converted to match the destination project. RADAR projects can be backed up in the RADAR format, which preserves the Undo list, or in BWAV, which does not. Looking at the RADAR 6 as a whole, it was the intuitive operation that really impressed me. You could quite easily — given the correct leads — connect a RADAR 6 up to a console and start recording without even consulting the manual. If you want an idea of how easy a RADAR is to use, check out this quick-start guide from the US hire firm Silent Way at http://tiny.cc/rq793w. Having no recording functions, the ADA II is, in some ways, simpler and even more intuitive to operate than the RADAR 6. The touchscreen, coupled with the simple menu structure, allows for very quick navigation around the unit's functionality, and I found setting up the unit and incorporating it in my studio setup to be extremely easy indeed. Not being a Pro Tools HD user left me at a disadvantage in directly assessing the operation of that aspect during this review, however the ADA II manual left me with no doubt that the implementation has been thoroughly thought out, right down to the setup steps necessary in Pro Tools to ensure trouble-free operation. The review RADAR 6 was fitted with iZ's latest Ultra Nyquist A-D/D-A cards, which are a major update on the earlier 96kHz Nyquist and 192kHz S-Nyquist versions. Having recorded various acoustic instruments and percussion with a pair of AKG C414 ULS mics through a Pendulum preamplifier straight into the RADAR 6 at 192kHz, 96kHz and 48kHz, I then fed its outputs straight into my ADAM A77Xs via a very high-quality passive volume control. The 192kHz Ultra Nyquist converter card, which can be used with either the RADAR 6 or the ADA II. To my ears the RADAR 6's Ultra Nyquist cards perform at a very high level, producing a natural, open, detailed sound with an extension in the bass that gives them a real depth in character. Given its relatively modest price tag, the Ultra Nyquist card compares well in terms of dynamic range and frequency response with other more esoteric eight-channel stand-alone converters with significantly higher price tags. At 192kHz operation I heard enough of a difference in definition and clarity over the output at 96kHz to make me think that engineers and producers in the more rarefied regions of classical recording could well be persuaded that 24 tracksof RADAR at 192kHz/24-bit just might be the answer to their studio, location and live recording needs. (I should point out here that you're limited to 12 tracks at this resolution if you want real-time crossfades when punching in and out (for 24 tracks the crossfades are calculated post-processing). For myself, I'd probably stick with 96kHz/24-bit for acoustic recordings, as the RADAR 6's combination of extended bass and accuracy in the mid-range and treble just seemed to work slightly better for me than the sound at 192kHz. This preference may simply be down to the limitations of my Adam A77X monitors; their frequency response of 38Hz to 50kHz pales beside the Ultra Nyquist's 10Hz to 80kHz at 192kHz. Working at 96kHz means smaller file sizes and also has the advantage of having the option to fit Classic 96 cards instead of the Ultra Nyquists, which would help the budget. Dropping the sample rate to 44.1 or 48 kHz brings back what I can only describe as the classic RADAR sound, reminding me of a really good two-inch tape machine. Although the RADAR 6's 48kHz response between 10Hz and 22kHz is as flat as a pancake, there's something about the warmth of the combination of bass extension and the 22kHz cutoff frequency that, to me, sounds 'right'. If I were still recording rock bands, I'd be running a RADAR 6 in 48kHz all day. At heart, I'm probably a natural RADAR target customer, as my recording preferences were formed in the white heat of an analogue Neve/Studer combination long before multitrack digital audio existed. Although these days I often use a computer-based DAW with a digital console on its front end for recording and mixdown, I'm still happiest with hardware in front of me. The RADAR 6 fits that need entirely. In one sense, it's very obviously a computer in a box, but in operation together with a monitor and a Session Controller Pro, it feels to me more like a tape machine with really good editing facilities. It's extremely easy to set up and operate, and the speed at which you can carry out tasks without burying yourself in windows and menus means that recording sessions flow in a very natural way. However, the RADAR 6 is a complex system and, having watched Paul Madden of London's Smokehouse studio flying around the remote, I know I've got a long way to go to get close to his level. The RADAR 6 was extremely stable during my time with it. I didn't have a single reliability issue and it didn't misbehave once. When I did find a problem with loading a track's worth of multiple WAV files generated from one of my DAWs, it took iZ support all of a couple of hours to identify the root cause (which wasn't down to the RADAR 6), research the answer and to send me a software beta version that completely solved the issue. Talking to other RADAR users, it seems that there's nothing unusual about this level of support. That alone could be a good enough reason to buy a RADAR 6. So, if you have the budget, should you buy one? That depends on your situation. For an existing user, upgrading to the RADAR 6 frame could make a lot of sense. It's smaller, lighter and quieter, and the removable The rear panel of the Radar 6, with various options fitted. The rear of the ADA II is almost identical. solid-state USB drives (or SD cards) make file transfers easy. The use of existing remotes and several cards could make an upgrade path a lot less painful than it might be otherwise. With a professional studio and the clientele to pay for it, two RADAR 6s, an ADA II and a DAW, all coupled to a tasty analogue console, would be an unbeatable combination. 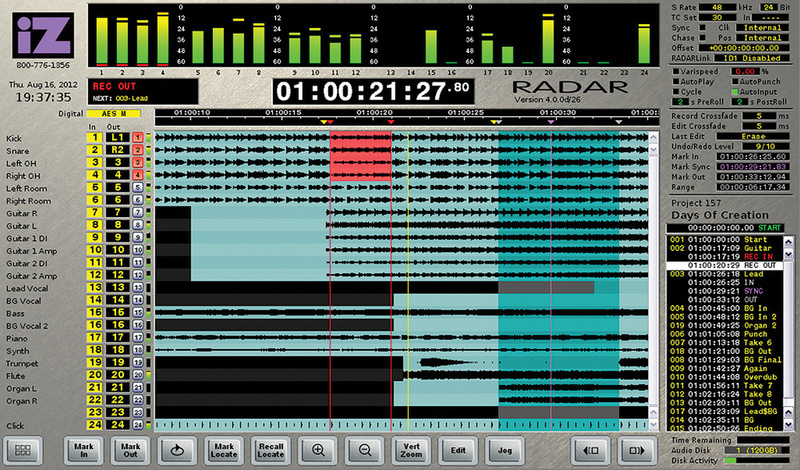 If that's a bit rich, then one RADAR 6 and a DAW is a powerful pairing that would cover the needs of most sessions. For location recording, a RADAR 6 with a touchscreen is a bulletproof one-box recording solution, and all that needs to be added is a console and/or preamps, plus a DAW back at base. For that hard-core, old-school rock vibe, a RADAR 6 and a good-sounding analogue console will get you closer to the sound of two-inch tape, except that this time round there are editing features that have many, many more options and opportunities than there were 20 years ago. Finally, a home project studio with a bit of budget would find a RADAR 6 frame fitted with an SD card slot, 24 channels of analogue I/O on Classic 96 cards and a touchscreen to be a cost-effective, upgradeable entry point. However, if you have the budget available but can't justify spending it all on a single piece of dedicated hardware that more or less 'just' records and makes cut and paste edits, then the RADAR 6 isn't for you. If you want to get that RADAR sound in your studio, you'll be looking to run an ADA II with 24 channels of Ultra Nyquist analogue I/O with your DAW. Although the RADAR 6 and the ADA II aren't exactly cheap to buy I believe that, given their level of performance, they do actually represent good value for money, especially when you think that there are RADARs approaching 20 years old out there that are still working and earning their keep. I don't think that we'll be saying that about 20-year-old computers and DAWs any time soon. The only (almost) comparable hardware recorder to the RADAR 6 that's currently in production is Tascam's X48 MkII. This 48-track 96kHz 'hybrid DAW' has a more comprehensive GUI that, alongside similar editing capabilities to the RADAR 6, features an on-board digital mixer with dynamics and EQ in each channel, but no effects. With the optional analogue and ADAT or AES3 I/O fitted, the X48 MkII covers a large part of the functional area of the RADAR 6, though MADI and 192kHz operation are not available. Crucially, there is no dedicated remote control. Direct alternatives to the ADA II are a little more difficult to identify. At a similar level of performance, multiple suitably configured Prism ADA8XRs with AES and Pro Tools HD I/O would give very similar functionality. The Antelope Orion 32 with its MADI interface fitted or an SSL Alpha Link MADI SX connected to an Avid HD MADI interface are examples of other functional alternatives that are worth considering. Full details of the various cost options can be found on iZ's web site, which features a useful estimate calculator where you can specify the system to your needs. To give you an idea of the typical systems a prospective purchaser might wish to assemble, and how much they might cost, please see below. I'm reliably informed by the UK distributor that almost all purchasers of RADAR systems seem to be VAT-registered, so all the prices quoted below exclude VAT. The RADAR being a modular system, the review unit came loaded with rather more than the average system and costs correspondingly more than you might typically expect to pay. The most affordable 'full' RADAR system would be a digital recording system without A-D conversion. That would comprise a frame without a touchscreen interface, a 120GB solid-state drive, a 24-channel TDIF card, and a KC24 compact remote for £4253$6164. One may wish to add a touchscreen for £483$700 and not purchase a remote. To replace the 24 digital channels with analogue I/O, a system featuring 24 channels of the Classic 96 A-D/D-A converters would set you back £6415$9299. Adding the sync processor to this last system, in order to chase and sync to SMPTE and MTC for use with your DAW, takes the total to £7102$10,294. A typical RADAR user usually wants a 24-channel analogue recorder with remote control and touchscreen. That would comprise a RADAR 6 fitted with a touchscreen, a 120GB solid-state drive, 24 channels of Classic 96 converter cards, the sync processor and a Session Controller remote control, and would cost £8826$12,794. Upgrading those 24 channels to the Ultra Nyquist 192kHz converter cards would take the total to £10,274$14,894. Typical pricing for the ADA II will depend very much on your choice of converter card, the number of channels required, and whether you wish to integrate the unit directly into a Pro Tools system. The Pro Tools HD Interface can be added to any system for £1376$1995. Good value in the professional marketplace. Fast, easy file transfer to and from a computer-based DAW. Can be used with or without an external monitor. None, despite the professional price tag. These two units are targeted at the professional market, so the professional price is no surprise. Refined by 20 years of continuous development, the RADAR 6 is the only dedicated, fully professional, 24-track, 24-bit/192kHz hardware recorder available. The ADA II makes the latest RADAR converters available to DAW users in a cost-effective, customisable package. The proven, long-term operational reliability of iZ's RADAR units, together with their stellar customer support, makes their latest products very viable long-term investments for the professional user. SCV London +44 (0)20 8418 1470.
iZ Technology +1 800 776 1356.